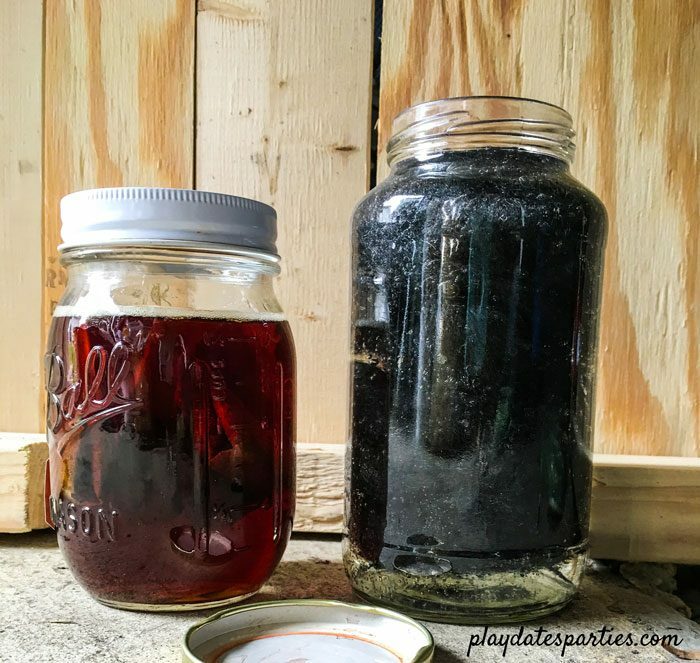 Get all the details on staining wood with steel wool and vinegar. 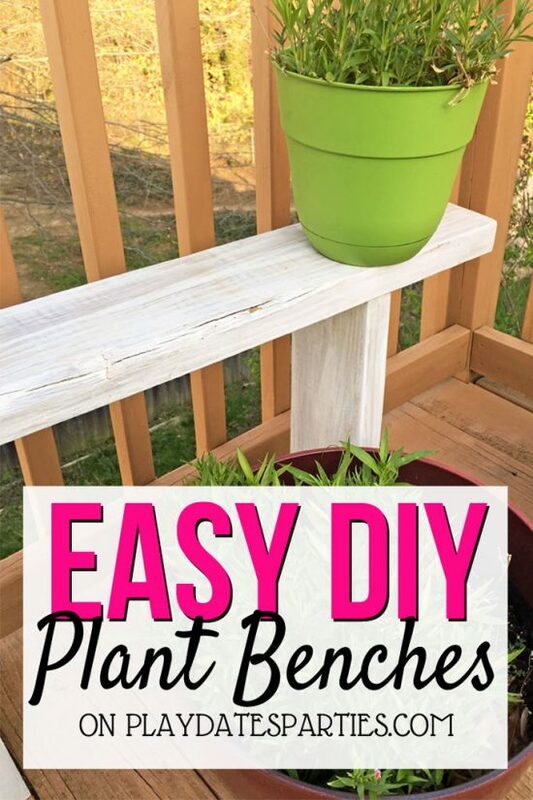 It’s a gorgeous way to naturally get that reclaimed wood look! Have you ever read a blog post or article that stuck with you years later? It might not even be about anything truly deep or earth-shattering, but you never seem to quite forget about it. 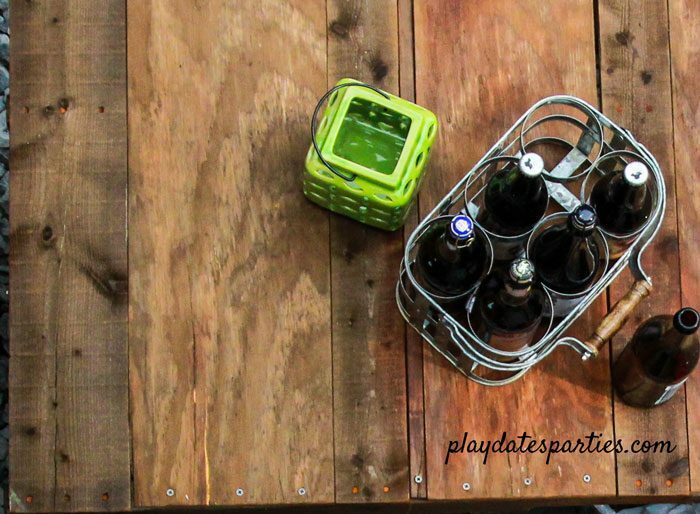 For me, it was a random DIY post on staining a wood tabletop with steel wool and vinegar. 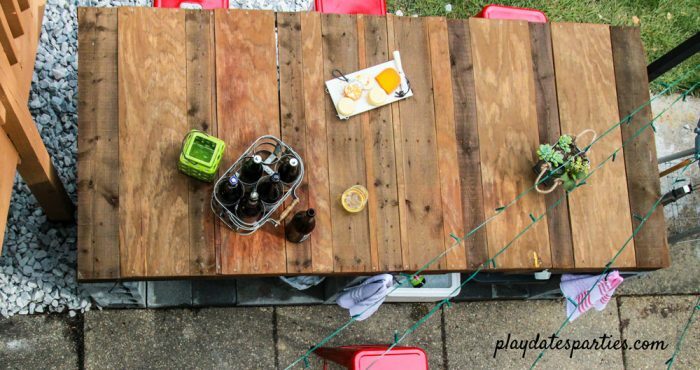 And when I decided to turn our 7-foot by 3-foot pallet into a tabletop for our outdoor bar, I couldn’t get that natural stain out of my head. 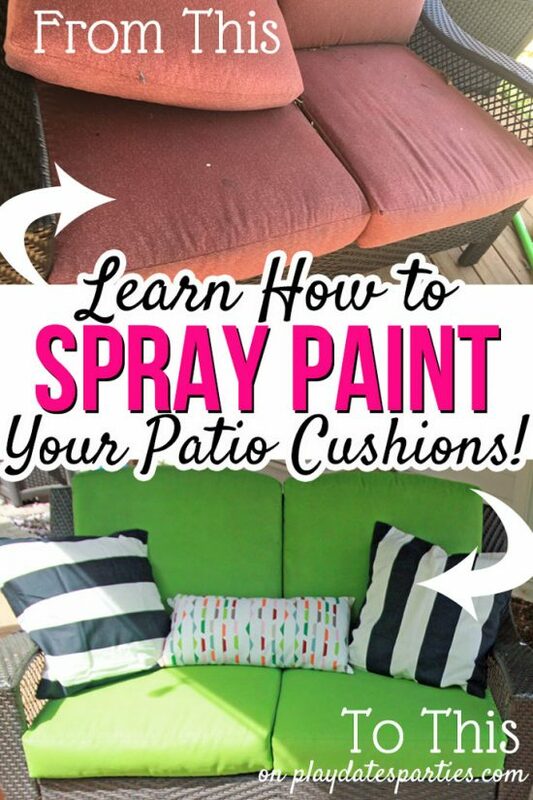 Now, I could have played it safe and used one of the countless cans of leftover paint and stain that is in our garage. But, honestly, I didn’t like the colors. Our house is trimmed in white and black, and those are the corresponding stain colors we have. But I wanted warm, reclaimed wood tones to contrast with the corrugated steel facade of the bar. So, inspired, I went in search of that original post…and found it! And in the meantime, I ended up going down the rabbit hole of researching steel wool and vinegar stains. But the more research I did, the more anxious I got. How long the solution sits before you put it on the wood. If you have the time and the materials, it’s best to test things out with some scrap wood. Or, you can just dive in and hope for great results! How does Steel Wool and Vinegar Stain Work? The reason that there is so much variability with this technique, is because it’s all based on a scientific reaction. When steel wool and vinegar are combined for an appreciable amount of time, the components start to create an iron oxide. When the iron oxide is brushed onto the wood, it reacts with the tannins in the wood to naturally oxidize the wood, creating a stained effect. The final color will be a result of how much iron oxide your solution has combined with how much tannin is in your wood. This is also why many use a pre-treatment with brewed tea or coffee. When added to low-tannin wood (like pine), the tea and coffee increase the tannins to create a deeper result. Time. The One Room Challenge deadline was approaching, and I didn’t have time to wait for the solution to come together properly. Weather. This pallet was HUGE, and we’ve practically been living in monsoon season here. So, I was working in a narrow area of our garage to get this done. Unknowns. I had no idea what type of wood was used to make the pallet I was staining, so there was no way to predict the final result without some testing. That combined with the time limit made this a real nail-biter! Challenges aside, I was committed to the project. And it was excited, even if it was nerve wracking. So, one night, I broke apart 1.5 steel wool pads (most recipes only use one pad), and placed them in a leftover pasta sauce jar. That got covered with white vinegar and then left to do it’s thing. Just over 24 hours later, my impatience got the better of me. I brewed a VERY strong batch of 5 black chai tea bags in a mason jar and started prepping the pallet. Thank goodness the pallet was large enough to do plenty of testing on the underside. 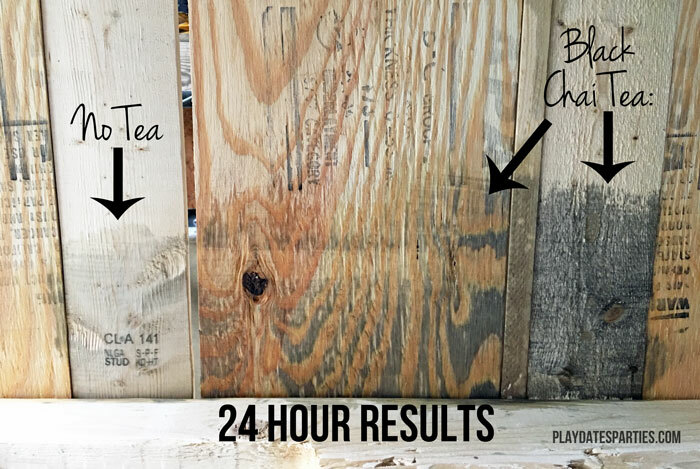 I painted some tea on one area of the pallet and then tested the vinegar solution with and without the tea base. The places with the tea solution were black, the pine plywood had a strange black and yellow zebra effect, and the tea-free areas were hardly changed at all! After a few minutes of pouting, I calmed down and decided to give the steel wool and vinegar solution another day to soak. The good news is, that it only took about 30 minutes to paint the tea solution on the entire pallet, which was left to dry overnight. The next day I went out and tested a small area again. This time, a silver-brown color started to develop immediately. Talk about relief! And as I worked, the colors changed further to a richer shade of brown. The alternating boards of whatever the pallet is made of and the plywood I used to fill in the gaps means there are slight differences between each board, which makes the pallet truly look like a reclaimed wood creation instead of something perfectly manufactured. I totally love it. What do you think? If you’re ready to give this technique a try, here are your step-by-step instructions! At least 48 hours before you want to stain your wood, break apart a pad of steel wool and put it into a jar. If you want to stain your wood sooner, leave the jar open. Otherwise, you can leave the jar closed for up to 5 days. While your solution sits, prepare your wood by sanding it down well. Every once in a while, give the solution a little stir or shake to help break up the steel wool. If you have a low tannin wood, like pine, paint the wood first with brewed tea or coffee and let dry completely. Seal the wood with a polyurethane or other sealer of your choice. You can see here that some glue in the plywood didn’t absorb the stain (of course), and some boards even took on a reddish tone while others are a rich brown color. I’m so glad I remembered that old post. There’s something so exciting about seeing transformations like this take place before your eyes, and to keep experimenting with more an more pieces. 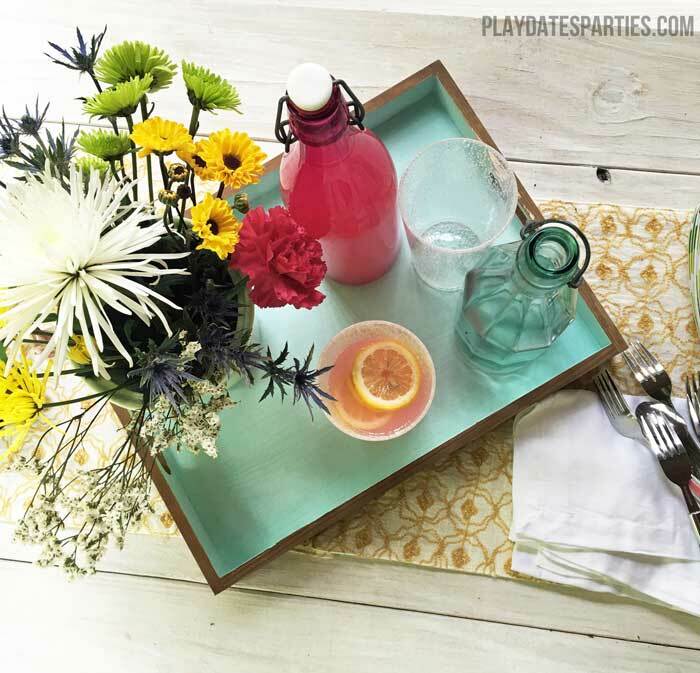 I used some leftover stain on the outside of this unfinished wood tray from Target. Isn’t it just perfect for summer? 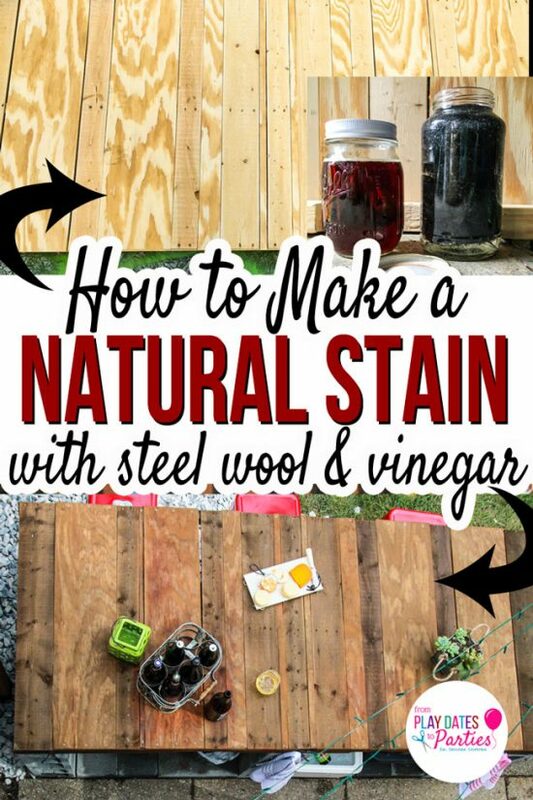 Have you ever used a natural stain before? What would you stain with steel wool and vinegar? This is Cassidy’s next weekend project! You are so timely. He was sand blasting or doing something like that last week. Next week is staining. I had no idea this was possible. Wow! I love using natural products to do this. I am hoping to stain some wood for a backyard art project soon. Will be trying this! Say What?!?!?!!?! I had no idea and am totally trying this! Thank you for the “how to”! Now this looks very doable. Thanks for the tutorial. Much appreciated. I love this. My husband and I are getting into making things out of pallets. 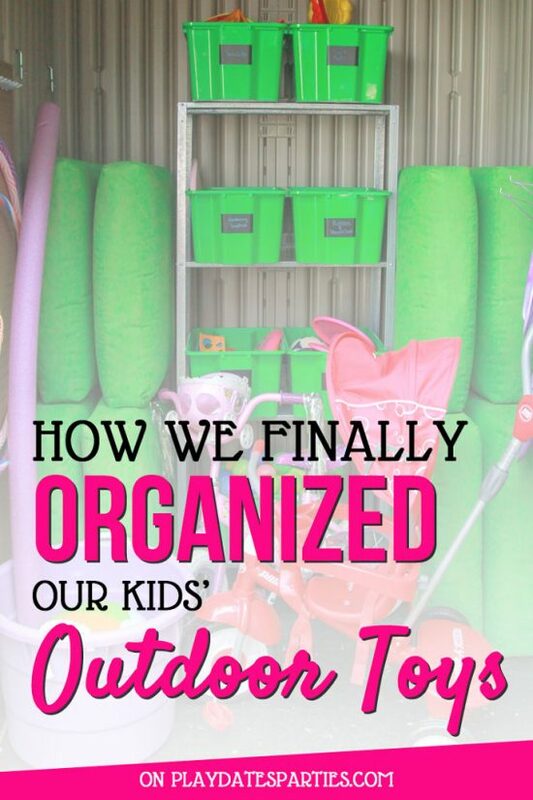 Love this post & the how to. Oh Leslie this is soo cool! I have never stained wood this way and would love to try it. I work with wood all of the time so can’t wait to experiment with this. 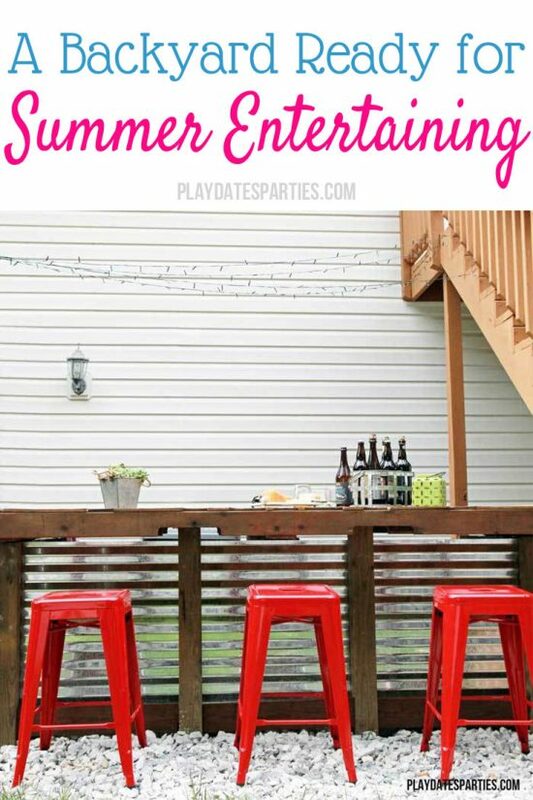 Thanks so much for linking it up to our Bewitchin’ Projects Block Party this past week. You are one of my features tomorrow over at http://www.recreateddesigns.com. I never would have thought to use vinegar to age wood. I can’t wait to try it. Thanks so much for sharing your tutorial with us at Merry Monday. What a cool idea! 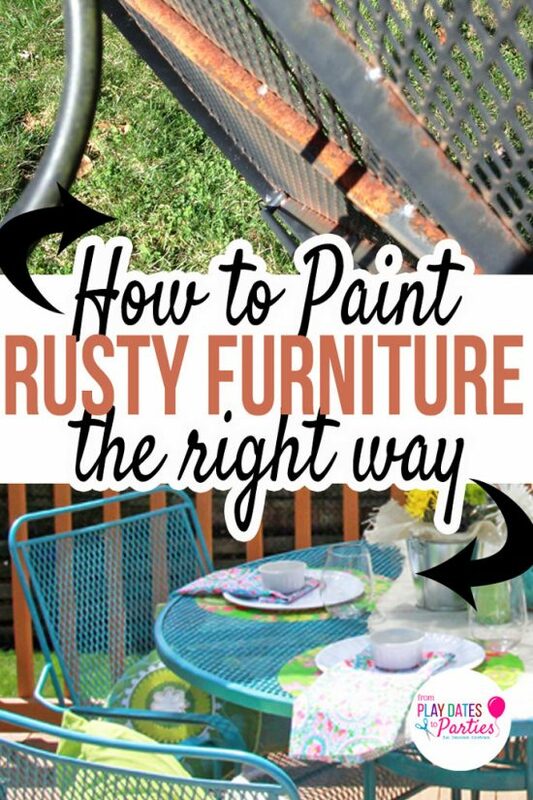 I am totally sharing this with my husband, the furniture stainer…visiting from the Best of the Blogosphere LInk Party! I have some wood I need to stain, I think I’ll give this method a try. I’m allergic to most chemicals but I could do this! Yeah! Thanks for the post. I tried this on fencing wood without the tea and the effects were more of a cedar color which I used on my bathroom walls.cut the curved edges off and layed them across the wall.the end results were beautiful for my rustic bathroom redo. I love this idea. 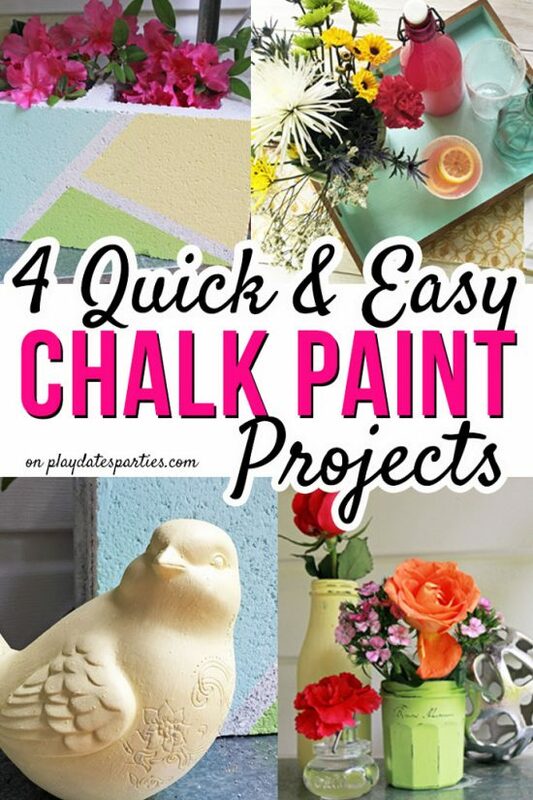 I have a large spool that I was going to chalk paint, but I like this idea better. Please share on my Sunday’s Best linkup. 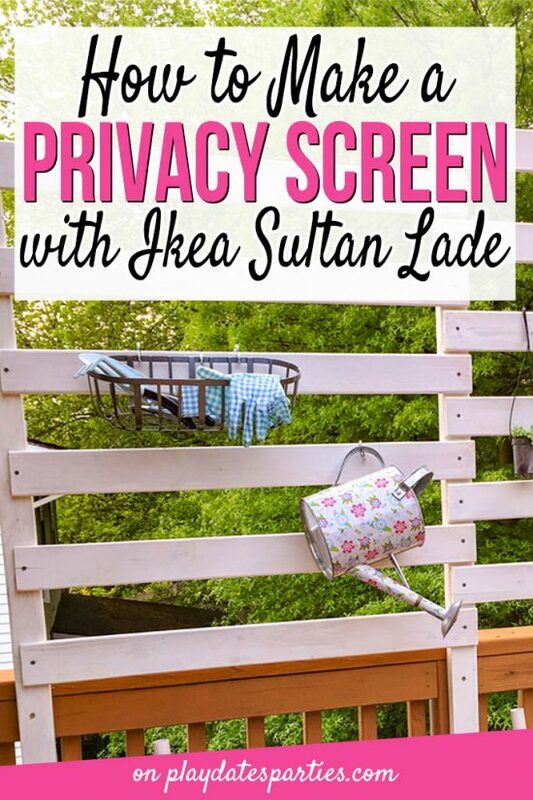 I guess if you are willing to go with the flow and are not super fussy about finishing with an exact shade this is a really fun way to stain your wood. I like the idea of not quite being sure what you are going to get. Pinning ! Thanks for doing such extensive research for us! I will have to play around with this and see how I like it. Found you on Simple Homestead Blog Hop. 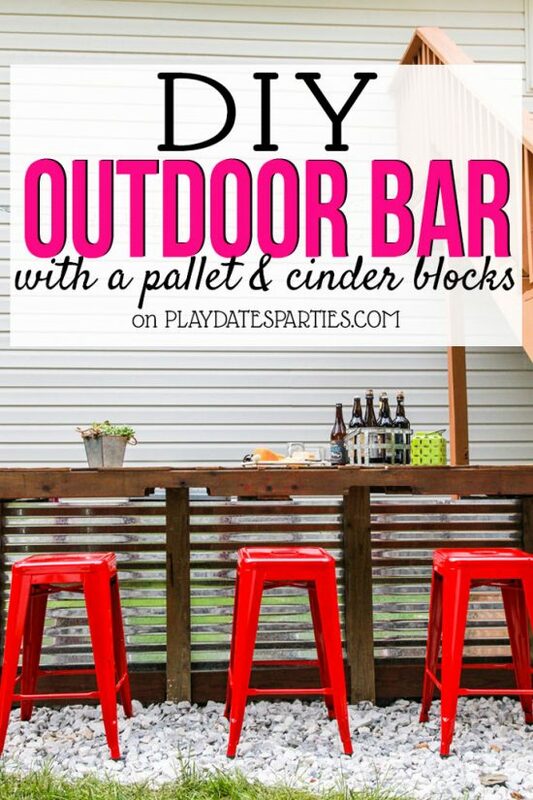 This sounds like a really good alternative for staining wood. Thank you for sharing the tutorial at The Really Crafty Link Party. Pinned. Another great post, Leslie! I have been wanting to stain a microwave cart that I have . This would be a perfect way to do it. This post is one of our features for Traffic Jam Weekend going live on Thursday, June 7th. Thanks for sharing!